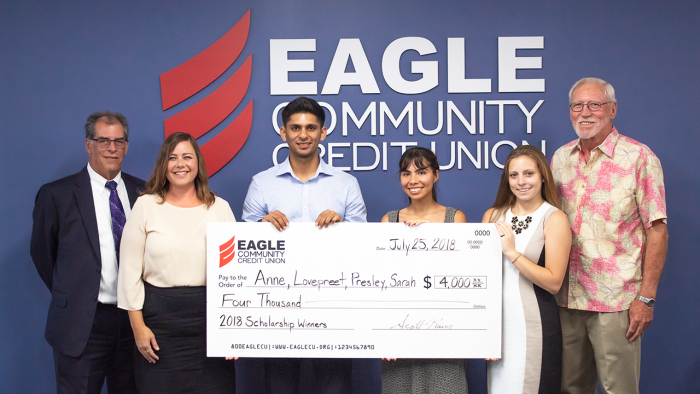 ORANGE COUNTY, CA (August 7, 2018) — Eagle Community Credit Union in Lake Forest, CA recently awarded scholarships to four local students. The credit union gave each recipient—Anne Chadburn, Lovepreet Singh, Presley Moreno, and Sarah Mitchell—$4,000 to help with college expenses. Mission Viejo, CA resident Chadburn is planning on attending Concord Career College and major in dental hygiene. Singh, a Santa Ana, CA resident, plans to attend University of California, Irvine and major in kinesiology, while Riverside, CA resident Moreno plans to attend UCLA and major in architecture. Mitchell, a Danville, CA resident, is attending San Jose State University and majoring in business. Eagle Community Credit Union President and CEO Scott Rains (far left) and Board Member and Scholarship Committee Chair Duane Anderson (far right) with the 2018 Eagle Community Credit Union Scholarship recipients—Anne Chadburn, Lovepreet Singh, Presley Moreno, and Sarah Mitchell. Eagle Community Credit Union is a not-for-profit financial cooperative committed to making a difference throughout Orange County. Eagle offers personalized service and value-oriented financial tools to more than 20,000 members. With strong roots as a postal and federal credit union, Eagle Community CU membership is open to anyone who lives, works or worships in Orange County, CA. To learn more visit www.eaglecu.org.